Update (Tuesday 7/26 6:45 PM CDT): We have instituted a new process to offer the final seats for World Championship events. Please read the updated information on the Join Us For Worlds article. Follow @FFGOP on Twitter for more updates. This November 2nd–6th, hundreds of players will arrive in Roseville, Minnesota to attend the 2016 World Championships and experience an event like no other. Some players have already started on their path to 2016 World Championships by winning a Regional Championship in certain locations. For those that haven’t, your path begins with 2016 World Championships registration. The 2016 World Championships schedule, including the dates for registration, will be announced soon. For now, we want to make sure that you are fully prepared for how the registration process will work this year! Today’s article details how to register and will get you ready to purchase tickets as soon as they go on sale. 2016 World Championships registration is entirely online. There will be no on-site registration. Registration this year will be different than last year. Each game will have a separate registration page. 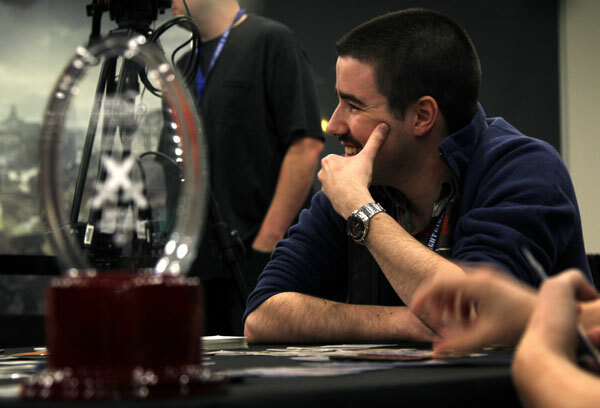 The first game that you register for will offer Full Event Enrollment for that game’s World Championship. 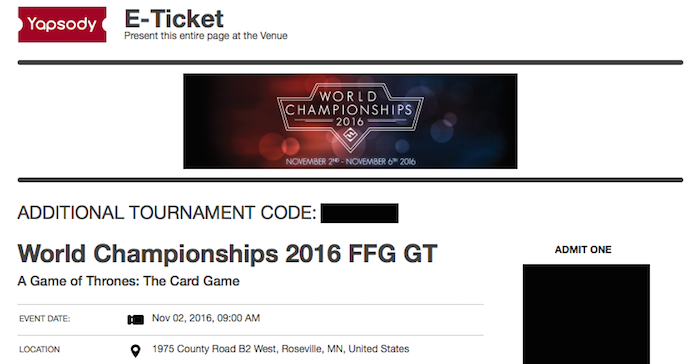 This ticket will give you admission to 2016 World Championships for the entire length of the event and all of its festivities, as well as entry into that game’s World Championship. You will also be able to enter side events for any of our games, by signing up on-site on a first-come, first-serve basis. After purchasing your Full Event Enrollment for one game, your confirmation email will contain a multi-use code for purchasing entry into other games’ World Championships at $25 per tournament. You can also find this code by looking at your past purchases on Yapsody, and selecting your $75 purchase to print ticket. On the registration page for any additional games you purchase, enter your code into the “Promo Code” fields, and you will receive the appropriate discount. You can use this code for as many additional World Championships you wish to enter. 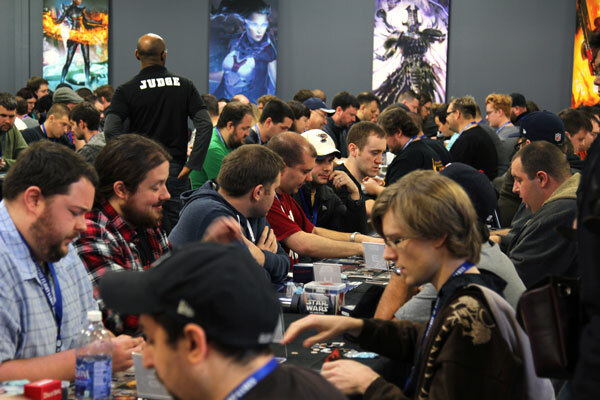 Note: Anyone registered with the Additional Tournament discount without having first purchased Full Event Enrollment will have their purchase cancelled without refund and will not be allowed entry into the 2016 World Championships. 2016 registration will be split across three separate dates and times, which will be announced alongside the 2016 World Championship schedule. We are splitting registration across multiple times so that players in different areas of the world will have an opportunity to obtain a ticket. At the allotted time for each “wave,” we will put a set number of tickets for each tournament on sale. All tickets for each tournament will be split evenly across the three waves. On the initial day of registration, the first wave for 2016 World Championships will open at 8:00 AM CDT. The second wave of tickets will go on sale at 2:00 PM CDT the following day. The third and final wave of tickets will go on sale at 8:00 PM CDT on the third day. We have reserved a number of seats for National Champions, U.S. and Canadian Regional Champions, the North American Championships top 4, and all previous World Champions. A Champion can claim their reserved seat by filling out our form. We will contact them with instructions on how to purchase a $75 Full Event Enrollment, or $25 Additional Tournament if they have already purchased a Full Event Enrollment for another game. Champions will have a seat reserved only for the game in which they are a Champion! 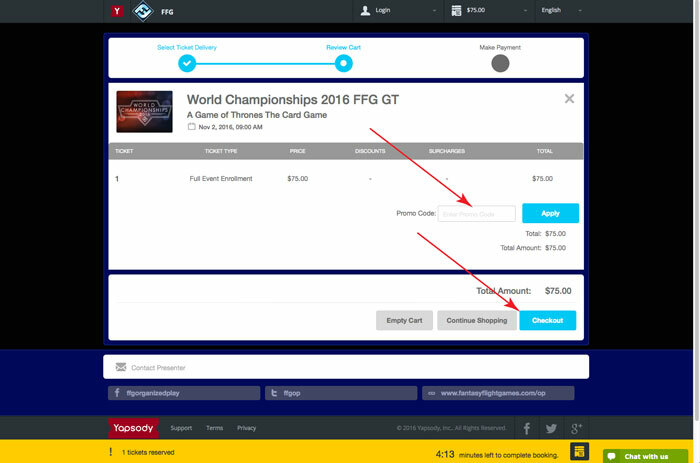 Champions must purchase entry to any other World Championship tournaments separately through the normal registration system. U.S. and Canadian Regional Champions, U.S. National Champions, and former World Champions must fill out the form by 11:59 PM CDT on Thursday, August 11th. All other National Champions and those who made the top 4 of North American Championships must fill out the form by 11:59 PM CDT on Tuesday, October 4th. Refunds can be requested by sending an email to [email protected] with the subject line “2016 Worlds Refund Request” and your registration information. Refunds are not possible after Tuesday, August 16th. Refunds cannot be issued more than 60 days after the date of purchase or for tickets purchased after Tuesday, August 16th. Note: We are unable to offer ticket or seat transfers of any kind. Only the player whose legal name appears on a ticket can compete in that event. All side events at the 2016 World Championships are free to anyone with a World Championship pass. If you have registered for at least one Championship event, you can play in any of the side events. However, side events do have limited space, and entry will be limited to a first come, first served basis. Tickets are limited. We recommend prioritizing your most desired Championship to give yourself the best chance at obtaining a seat. 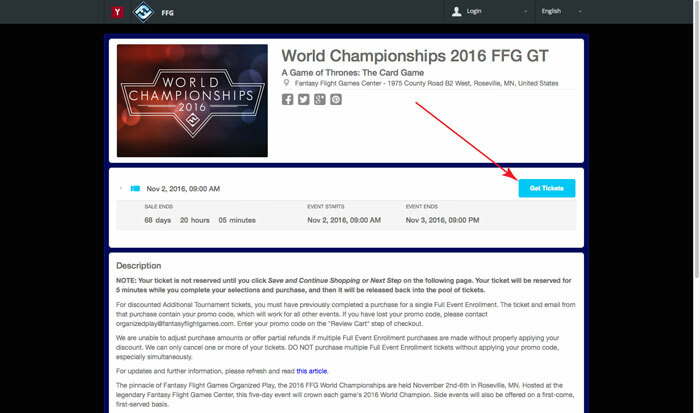 Click here to access the World Championship registration system. 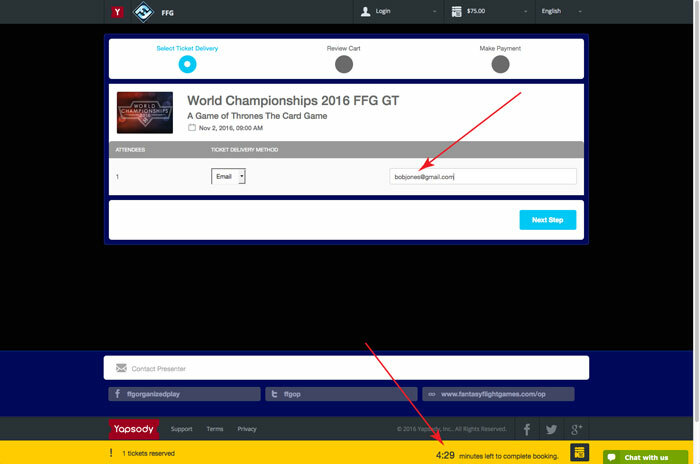 After selecting an event, click on the "Get Tickets" button on the right side. Please purchase a Full Event Enrollment ticket before attempting to purchase any other tickets. If you purchase multiple Full Event Enrollment tickets, we can only refund the entire cost. On the following page, confirm you are buying a ticket for the game of your choice and the price of the ticket, then click on the "Next Step" button. Please enter your email address on the subsequent page. This is how your ticket will be delivered to you and is the only method available. Note: Once you reach this page, your ticket has been reserved for you, but you have only 5 minutes to complete your transaction before the ticket will be made available to the public again. Your remaining time will be displayed in the yellow bar at the bottom of the page. If you are using a multi-use code to purchase additional tickets, enter them on the following page and click on the "Apply" button before continuing. If you are not, click on the "Checkout" button. On the final page, fill in your email again, as well as your name and additional information. If you already have a Yapsody account, much of this should auto-populate. Make sure to select a T-shirt size and enter a badge name if you wish for the name on your badge to be different. Read the Terms and Conditions thoroughly, and check the box to confirm your agreement. 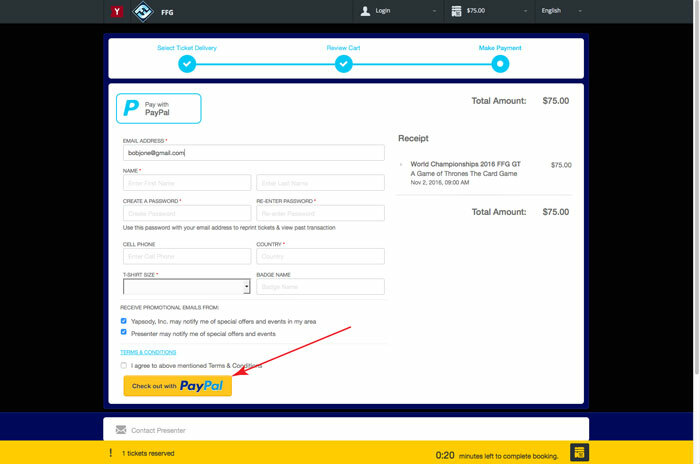 Once all of your information has been entered, click on the "Check out with PayPal" button and head to checkout! If you would like to purchase entry to another World Championship, follow the steps above and make sure to enter your multi-use code! Remember that your ticket will be emailed to you, and you can view or print it again by accessing your Booking History after you sign-in at the top of the registration page. Registration for 2016 World Championships will be opening soon. Tickets will be in high demand, and we recommend registering as soon as possible to guarantee your spot in the tournaments of your choice. We would love to see you in Minnesota in November for the biggest event of the year!